The first time we shared Khalik Allah’s work with you was back in March 2014 when we featured one of his awesome photos. If you missed that feature back then, we recommend you check it out. It is well worth the read. Then, in July 2014 we were very lucky to get a chance to interview Khalik Live from his studio in NY / USA. Khalik is an amazing person, highly empathic, really aware of his surroundings and with strong beliefs about what he does and where he stands. He is a solid Photographer and also Filmographer that loves using film for his projects. Khalik’s interview was one of our best and we highly recommend you take the time to watch through all of it so you can get to know more about him and his unique work. Khalik is a respectable and talented individual and I consider myself gifted to have met him, even if it was online. In August 2014 Andrew wrote a wonderful piece on Khalik Allah, in the “Under the influence” weekly series of posts and explained in his own words how Khalik’s need to express, to create, to convey his message have influenced him in his Street Photography. An inspirational read from a great writer about an amazing artist. 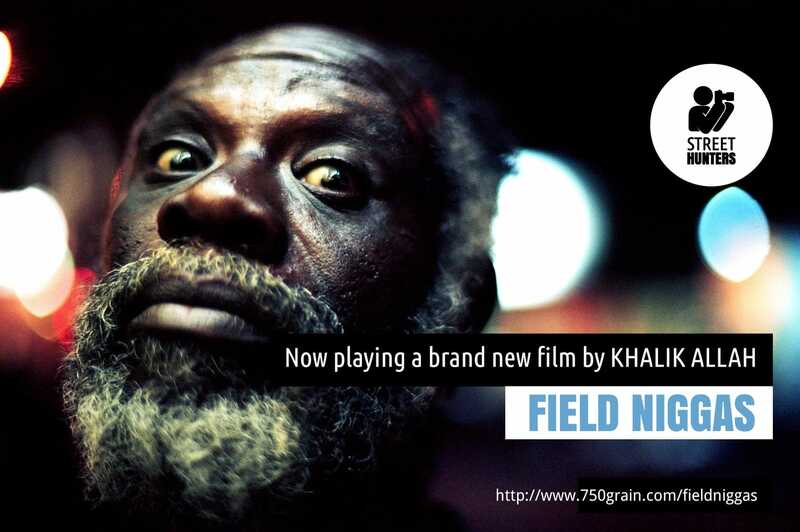 Today, we would like to share with you all the amazing news of the release of Khalik’s new film called “Field Niggas”. It is a film that touches the soul and inspires. Watching it feels like seeing a multitude of perfectly exposed Street Photographs, one after another that get their strong message through movement. A message that is enhanced by the addition of his film characters words that can be heard clearly in the background. So, StreetHunters.net Readers, either visit the home page of the Elephant Gun collective and to watch “Field Niggas” the latest Khalik Allah film, or watch it here directly from Khalik’s YouTube channel. UPDATE (01-05-2018): Today we noticed that the film has been removed from YouTube. Inside Rémy Chanteloup's Camera bag! Creative title, is it not? It used to be free Erwin. I don’t know why it is private now. You will have to check with Khalik’s YouTube Chanel. Thanks Spyros. So I was on his youtube channel and there it is also private. DO you by any chance have any contact info for Khalik? I contact him via his flickr page at https://www.flickr.com/photos/71883347@N07/.